Money box; rectangular shape with rounded narrow sides. Made from metal with a hinged handle at the top. Attached to the front face by three rivets is a circular plate with the emblem of the New Zealand Post Office which consists of an heraldic shield with a lion and flag on top, Britannia at the left and a Maori figure at the right, and the text ONWARD beneath. On the reverse is another plate with the text NEW ZEALAND / POST OFFICE / SAVINGS BANK. On the handle is engraved 23135 and on the top of the box FISCUS LTD. The base has an esutcheon (key not present). On the left narrow edge is a money slot. The Post Office Savings Bank was an important service offered by the local post office from the 1860s. In many small towns and isolated rural communities it was one of the only financial services available. Due to legislation which restricted the rights of other savings banks, by the mid-1950s the Post Office Savings Bank controlled around 80% of the personal savings market. Hi , I also have one I am going to sell its A New Zealand one but made in Ediswan England .It is exactly the same as the one above but has 8543 stamped on it . The reason people dont have a key is they didnt give you one . My grandfather was a Postmaster and mum remembers people had to go in to the Post Office and they unlocked it . Is it valuable if so how much would i get for it please. I'm a collector of money boxes. It is a very nice one and hope to add one of these money to my collection. I have one of these also - 8878 and understand that I will have to get a locksmith to open it and make a key. I would actually like to sell it - does anyone know if there is any demand for these old money Boxes? 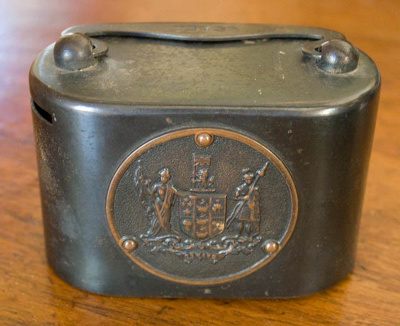 I have found one of these money boxes however the engraving on the top states the manufacturer is Richardson McCabe & Co Ltd, Wellington, Sole Agents For New Zealand. Below this is RH Burman Ltd. The number on the handle is 85008. The money box has a small round hole below the coin slot for Bank Notes, is this standard? Are these worth much? My money box is numbered 59469 and is locked, but the coins rattle. Would love to open it so if Cedric can send the A4 outlines, I'll get a key made, and then let you know the age of the coins. It was produced circa 1915.Fiscus was a UK ammunition maker,and the metal used same as heavy weaponry.I have one in better condition than the scan.Also the original box. (Plain: black, thick gauge ,lined ,cardboard).No key though. I to have one the same, Number on handle is 3962. Our key was lost but would like to get hold of another. I have scanned my keys with measurements (A4 print) for an enquirer. Can email it for others to take to local locksmith. My moneybox nr.81126 is same quality as above photo. I went to Locksmith - he opened it ok & built new keys (not easy) cost me A$37. I could get duplicates cut for anyone interested ?? because it will be a universal fit. I HAVE THE EXACT SAME BOX WHICH HAS BEEN IN MY FAMILY FOR AS LONG AS I CAN REMEMBER.THE ONLY DIFFERANCE IS MINE HAS THE UK POST OFFICE ON IT AND I HAVE A KEY WHICH I BELIEVE MY GRANDFATHER MADE IT.I AM 68 SO THE BOX HAS TO BE REALLY OLD. ED. Pauline, you will have to go to a locksmith to get a key, the bank had all the keys for these. Does anybody know how old these banks are? I have one that is identical to this one, having the serial number of 20715. Also is it possible to obtain a key for these to enable the opening of it? I am in Australia and found this is a curio shop many years ago. They are extremely well made and very secure with the one way action at the slot. I have always wondered if there were any old bank notes in it? I know there are no coins. Thank you. Where do you get a key as i have one with money in it.I live in Ashburton NZ.